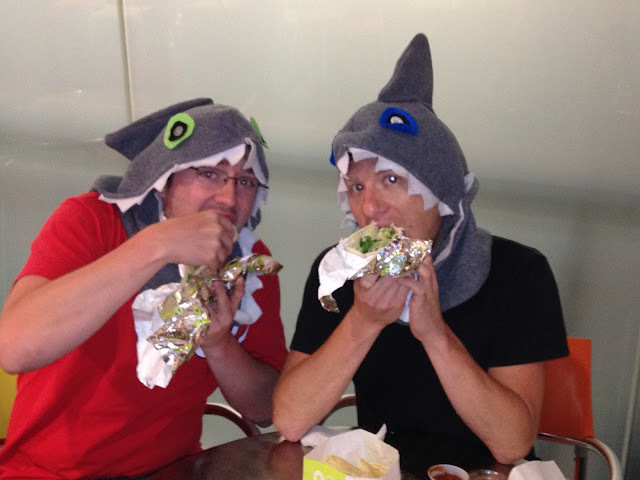 The Sharkadina Blog: How We (Almost) Won Free Burritos For A Year (Again). How We (Almost) Won Free Burritos For A Year (Again). Here's a little story for you all on this fine Shark Weekend morning. Remember last year California Tortilla offered free burritos for a year to anyone who could get a picture of Roger Bernadina eating a fish taco? Well, no one won, but it did give the Shark a lot of publicity and a lot of photoshopped pics ended up on the Cal Tort website. Why didn't we win this contest, you ask? Well right before Shark Week last year, Bernadina was optioned to Triple-A Syracuse which led to THE SADDEST SHARK WEEK EVER. Boy, what a difference a year makes! I would call this THE HAPPIEST SHARK WEEK EVER with Bernadina batting 5-7 with 3 RBI's. 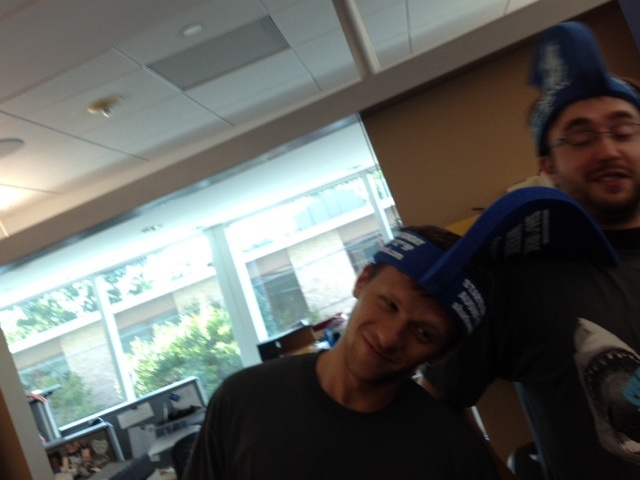 As you are probably aware, we (Terry Cangelosi and Tyler Stoltenberg) are Roger "The Shark" Bernadina's biggest fans. We were the ones who nicknamed him the shark and we run the semi-popular blog www.Sharkadina.com. 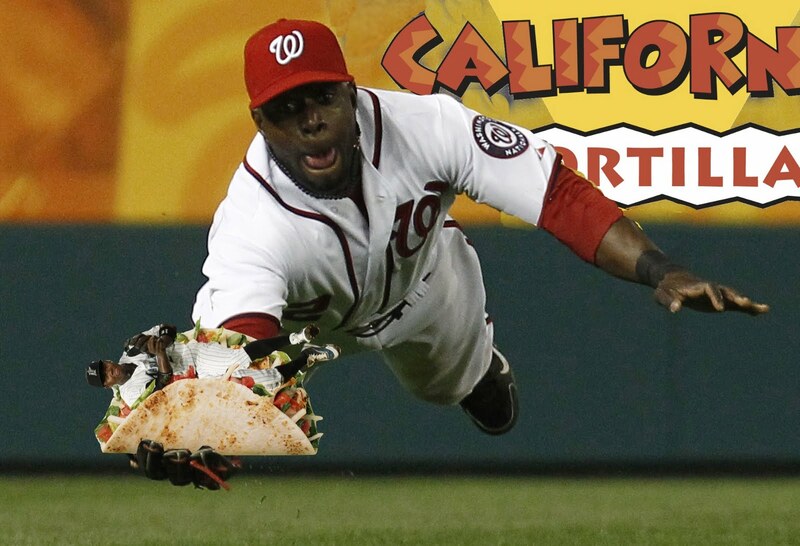 We love CalTort and we love the competition that you have started to catch Roger Bernadina eating a fish taco (We have submitted photoshopped pictures in the past). We would like to regale our story of attempting to win your contest. On Friday, we bought two tickets for Sunday's Nationals game. We cleaned and pressed our shark hoods, and mentally prepared all weekend. Come Sunday morning, we stopped by California Tortilla in Bethesda to buy a fish taco and bring it down to the game. We arrived at approximately noon for the game. 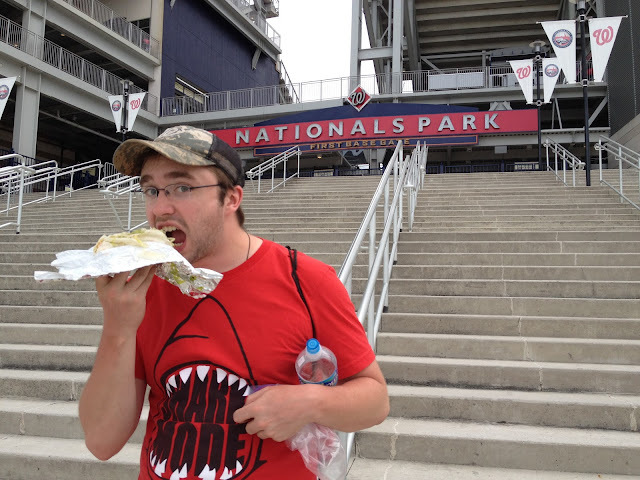 We baked in the sun for four hours and watched the Nationals defeat the Florida Marlins (another fish) 4-1. To prove that we were there, here is a link to us being interviewed live during the game by Fox Sports Florida. We waited for another hour after the game, with our taco, in the hopes of snapping a picture and winning free burritos for a year. Unfortunately, the Nationals had to leave right after the game to catch a flight to Houston. Therefore, Bernadina could not come out of the park after the game to sign autographs (or take pictures) as they got right on the bus to leave for the airport. The closest we got was a wave through the window. We did get a picture of Tyler with the taco outside the stadium to prove how close we got. seriously, try these fish tacos. they are jawesome. Anyway, we know that we didn't win the top prize, but we were wondering if there were any consolation prizes for our (near) success! We'll definitely be stopping by to get fish tacos and Shark fins tomorrow for lunch! get your fin out of my face! duh dun duh dun duh dun...ok, out of the water!